Are Richard Linklater and Whit Stillman the same voice for different audiences? by Jordan Aaron & Joel Kalow JORDAN: Richard Linklater and Whit Stillman share the same voice for different social classes. 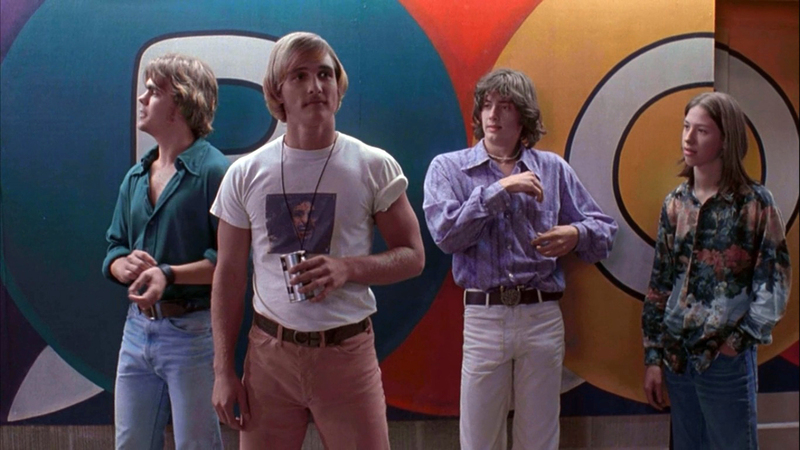 For example, Dazed and Confused and The Last Days of Disco share common themes of social structure and people who are new to this structure finding identity within it. In Dazed and Confused, Mitch is welcomed into a confusing group of people in which different types intermingle: A world where Ben Affleck’s O’Bannion is a horrible person, but is still well liked — a world similar to that of The Last Days of Disco, where Alice finds Charlotte to be a horrible person with a flourishing social life. The two filmmakers share similar plot structures and themes, yet they speak to vastly different audiences. Stillman’s characters, locations, sets, costumes and props all speak to a higher class audience; one that appreciates references to theater and old literature as well as characters that speak at a fast pace. There are girls in gowns and costumes at lavish nightclubs, conversations cover different kinds of housing and how that reflects one’s social standing, and the characters are in publishing and try to reach the top rung of the social sphere. Linklater’s cinematic world, on the other hand, involves high school kids speaking with slow, southern drawls wearing t-shirts and jeans, hanging out in old cars, getting drunk and high in the woods (as opposed to an exclusive nightclub), and wielding shotguns at their front doors. These characters haven’t a care in the world. Where Whit Stillman brings a message of questioning social structures to a higher class audience, Richard Linklater appeals to the bottom of the social ladder, specifically the working class people of Texas. JOEL: There are definitely many similarities between the two filmmakers, from the way their stories unspool at a trickling pace (à la Before Sunset’s real-time duration or The Last Days of Disco’s vague time lapses) to their generally predominantly white casting. But to conflate their themes and plots would be oversimplifying at best. Every Linklater film is in some way about time. He explores other themes as well, of course, from high school angst to small-town treachery, but his principle focus is always time. It is obvious in his more independent works, such as the Before Sunrise trilogy or Boyhood, but it’s even present in his more mainstream movies, such as School of Rock, in which the central protagonist must accept that the time of the past is gone. Much has been written about Boyhood’s experiment, in which Linklater shot with the same actors over a 12-year period. What many do not acknowledge is that the director already accomplished this in his Before trilogy, exploring the relationship of a couple starting in 1995, then in 2004 and most recently in 2013. All three are wonderful pieces of cinema, forging a romance that the audience cannot help but feel a part of, as if we are an awkward third-wheeler, spying on their European trysts. The three films also share a sense of wealth and intelligence that would seem to contradict your theory about Linklater’s appeal to the working class. While the couple is never truly rich (although they seem to be well off by Before Midnight), they certainly are not “the bottom of the social ladder” (and frankly, the kids in Dazed and Confused are not either). Indeed, the subjects that the two leads discuss in the trilogy include philosophy, art, literature, the environment and a myriad of other topics that you imply would fit more cleanly in a Whit Stillman film… yet the movies are unmistakably Linklater’s. 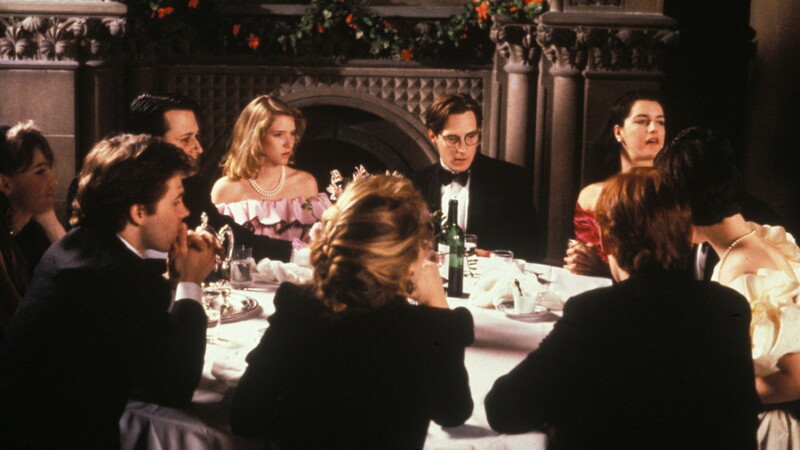 Whit Stillman’s primary through line is his satirical examination of the young bourgeois. He usually sticks in an “everyman” figure, such as Tom Townsend in Metropolitan or Alice in The Last Days of Disco. What elevates Stillman’s films from simple satire is his genuine warmth and compassion for the people in his stories. He’s not afraid to sketch unpleasant, obnoxious, even diabolical characters (Chris Eigeman as Nick Smith in Metropolitan is example A through Z). But ultimately, the characters in Stillman’s movies are haughty and faux-intellectual because they are so despairingly anxious and alone. They find solace in each other’s wit and self-involvement, in debutante balls and expensive apartments, but Stillman is always sure to point out how empty the whole charade truly is. So what do you think, Jordan? Are the directors as similar as you originally described, or are they two distinct filmmakers that happen to intertwine occasionally? Are Stillman’s films for the higher establishment, or a gentle mocking of their lifestyle? Are Linklater’s films blue-collar, or are they deeply felt investigations into our relationship with time? JORDAN: I can’t argue against your point of Linklater often incorporating time into his films, but I don’t see how that is relevant to this argument. While time is an important aspect of Dewey’s character in School of Rock, it’s still a film where Dewey has to come out of struggling to pay the bills and the mentality of “sticking it to The Man” and enter the world of “The Man,” where there is strict social order. He has to learn how to find his place in this society while also holding true to his roots, another example of a Linklater film dealing with a sense of self in social structure. In Metropolitan, Tom is the everyman character who enters into a world of strict social structure and practice. In The Last Days of Disco, Alice plays this role, as you said. Even if it’s satirical, Whitman is constantly reaching into the worlds of higher social classes. Dazed and Confused and School of Rock do this exact same thing with Mitch entering the world of high school and Dewey being placed in private school. The Before trilogy is certainly a fine example of Linklater’s fascination with time, but the characters are nomads who wander the city of Vienna. Yes, they grow over the years and become more well off, but most of their struggles come with rising up to that level, pondering if whatever they have will ever be enough. In fact, time plays a part in the films’ endeavors of exploring new social complexes. Sure, these films deal with themes of the past, but that doesn’t negate its look into the social structures of high school that involve rigorous hazing and party culture, or coping with new social orders that come with becoming an adult. You argue that they both speak the same ideas of art and literature and other forms of culture, and that only proves my point further. My argument is that they speak languages to different classes to communicate the same ideas. In School of Rock, Dewey counters the “The Man’s” dismissal and trivialization of rock musicians, questioning the higher social order’s ability to deem something good or bad art. In Dazed and Confused, Mike and Tony often analyze politics, art and other things. What makes them speak to a different class is how they talk about things or how they fit into their social practice. They love “everyman things” like Aerosmith and want to go to their party in the woods. The same goes for characters in Last Days of Disco, like Josh, a character who loves disco, but dresses up in suits and goes to lavish clubs. This is to say, the two most definitely share similar themes and also differ in significant ways. So no, I don’t think they are the same director making the same movies as you exaggerate my statements to sound. Linklater deals with the “Joe Schmo” that goes to parties in the park, hangs out at pool halls, performs in dingy clubs and wanders cities at night, while Stillman works with self-described yuppies that venture night clubs, meet at their organized formal events and analyze the social importance of living in a certain type of apartment. Now, what say you? Does Linklater really only explore time in his films or does he sometimes use it as a means to exploring other ideas? Does Stillman’s “gentle mockery” negate the fact that it speaks through that lens of higher establishment? JOEL: I think you misinterpret my argument. 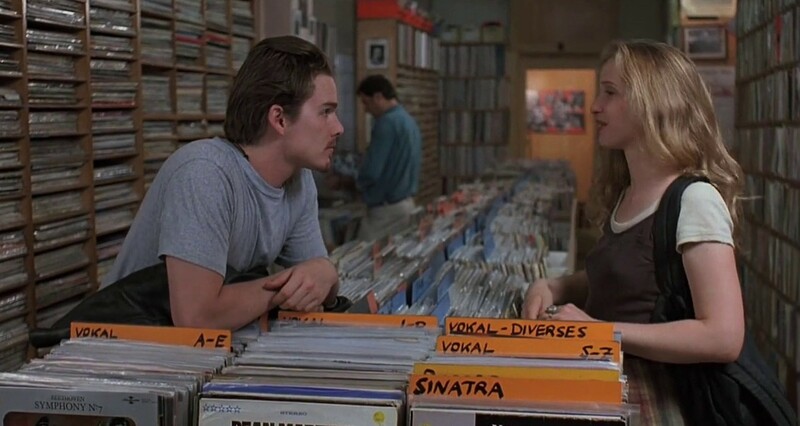 Time is the thematic thread that links all of Linklater’s films together. Of course his films are not limited to just that, but ultimately his forays into other thematic material — whether that be the ennui of being a 30-something who hasn’t accomplished anything or the examination of small town politics — merely serve to underline his focus on our relationship with time. I don’t think that just because the characters in both directors’ films occasionally discuss similar topics, it means Linklater and Stillman are working with the same thematic material. The closest connection I can make between the two is between Dazed and Confused and Metropolitan, as they are both working within the coming-of-age genre (although even then, that seems to do both films a disservice in ignoring their complexity). I suppose where I balk most at your thesis is where you call Stillman and Linklater the “same voice.” Linklater’s films work in a kind of Americana-realism (#coiningit), where the characters we see on screen can be recognized in our everyday lives. The world Stillman crafts is much more theatrical (which makes sense, considering his penchant for satire). His characters live a life that is foreign to his audience. Take The Last Days of Disco, which came out in 1998, a time when disco was already an embarrassed memory many had brushed under the rug. In 2016, it is even more laughable. But what makes the film memorable is the characters’ certainty that disco will never die, even when it so clearly has already gone over the hill. Josh Neff’s confidence in the return of the lifestyle is funny, yes, but it is also sympathetic. After all, this is a man suffering from manic-depressive disorder who finally discovered his own personal eden. His conviction is heart-warming, and is ultimately what sets the film apart from other, cruder satires. The Last Days of Disco ends with Neff and Alice dancing in the subway to “Love Train,” soon joined by strangers on the train. It is a powerful moment, as seeing people from all different walks of life dance with no inhibition to music so silly and dated makes it endearing. Stating that one director appeals to one side of the social ladder and one appeals to the other cheapens the films of both directors. Linklater’s films may more often depict the lives of a more rural America, but that does not mean that the people who share this lifestyle are his audience (especially when he dabbles in experimental fare, such as Waking Life). Stillman’s films definitely focus on the upper-upper class of America, but in their dedication to exploring the humanity behind the thick veneer of Jane Austen and Charles Fourier references, Stillman illuminates anxieties and follies that plague all of us, from the bottom of the social ladder to the top. If anything, his films seek to implode the perceptions of the social hierarchy. Regardless, we should thank both Richard Linklater and Whit Stillman for giving us such wonderful works. The careers of both have diverged much since the 1990’s (Linklater has become an icon in American cinema, whereas Stillman has stuck in the outskirts of the indie scene), but their mark on cinema is undeniable. Tags: Joel Kalow, Jordan Aaron. Bookmark the permalink.